No added colourings or flavourings to be used. ROW: Our cider has a beautiful natural apple green / straw colour, it needs no further enhancement from colouring or flavour. ROW: Our cider has a natural slight effervescence requiring no additional carbonation. Sweetener may be added to fermented Cider/Perry to make it sweet or medium. ROW: Generally our apple mixture gives a good balanced dry cider which we prefer to provide to you with no additional sugar sweetener. For those who do prefer we also produce a quantity of Tasty Old Wife and Blushing Old Wife which are medium. The addition of water is permitted to bring the alcoholic content of the Cider/Perry down to the level required by the producer. Ideally, however the minimum juice content should not be lower than 90% volume. No micro filtration allowed (this takes all the yeast, leaving a "dead" product). ROW: At the crushing and juice stage our product is strained though course sieves to remove any pieces. After this no micro-filtration is done and we carefully leave the oak fermentation barrel sediment behind before freshly placing into the delivery barrel. This ensures a clear / clean cider. We feel if you want to have something floating in it better to add a straw or an ice cube later! 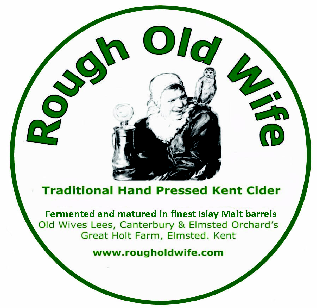 Who is behind Rough Old Wife Cider? As they say a picture tells a thousand stories so have a look below. Its a family and friends affair started by Jan & Andy Maclean and Simon & Annie Reed as the main partners. Today Simon & Annie run the business but everybody mucks in at picking and pressing time and as much of last years cider as possible helps to keep the troops going over the few weeks! You may spot the resident farm dog and her unique apple picking technique - for those we might have missed!